Will fit 8" or larger tubes, as well as flat tube surfaces. Drop-in replacement for many Orion Newtonian and Dobsonian telescopes, including Intelliscope dobs (will not work with SkyQuest XT8 Classic Orion dob sold before 2007 unless you drill new holes, or some models of the XT10i). Please use the information below and in the photos to confirm whether this focuser will work with your telescope. All measurements below are measured from the bottom end of the flat base plate. There will be an additional gap of 1-2mm between this base plate and the telescope tube which will depend on the diameter of your telescope tube. Focuser includes a 1.25 collet that can be used for added extension. This can add up to 0.85 (21.7mm) to all the above 2 heights. However, it can skew the optical axis significantly and is not recommended for frequent or imaging use. 4.6 (Based on 13 Reviews) 100% of reviewers recommended this product. Very well made. What I am most pleased about is Agena's quick service! Price was tens of dollars less than Orion's for the same focuser. I'll be a future customer. Very good product, solid and robust! Unfortunatelly I didnt pay attention to the chart with measurements and size. When I tried to install in my SW 200mm F5 it did´nt work. However I am storing it for future reflector building by myself. Review by Occasional stargazer of Toronto, Canada. I bought this focuser to replace the simple focuser on my Orion XT10 reflector, actually I have to drill holes to install the new focuser. It's very easy to use and has a built-in adjust tube so you could first adjust it if you could not reach to the focus plain. Review by Stardust 11 of Lakewood, Ohio. 5.0 Focusing is a snap. Great product. I use this product on my Dobsonian. It makes focusing easy and accurate. It glides into focus and is a joy to use. Review by rford322 of Redondo Beach, CA. The dual speed focuser action makes precise focusing easy. My sharpest astrophotos were made using this focuser. I highly recommend it. Review by tezster of Canada. I upgraded the standard crayford focuser on my dob with this and am very pleased with its performance. The focuser has a very sturdy, high quality look to it. The built-in extension tube is a fantastic feature: no need to fiddle with using an extension tube should you require more back focus (and because it's low-profile, front-focus isn't an issue). Using the micro-focus knob is pure joy. A very good focuser overall. -The mounting holes are angled, which is great when installing directly onto a tube, but a little trickier when installing onto a flat mounting plate (still possible, however). -I feel that the primary focus knob tension is a little too high i.e. it takes more force than I would like turn the knob. No such problems with the micro-focus. -The increased weight of the focuser (compared to my old one) required a slight rebalancing of the scope. Not a significant issue, but worth mentioning. The design of my telescope is in process, yet. But I think the installation of the focuser will be very easy. The guiding of its inner tube is amazing. It is very smooth and exact. The focusing range will be enough for my every eyepieces and photo equipments. It is really strong construction, I tried my every large eyepieces (8, 13mm Ethos and 17, 22, 31mm Nagler) in it. I didn't detect any kind of slip. It has very aesthetic looking. Review by vsoer of Glen Ellyn, IL. Smooth operatation. Easy to install and use. A bargain for the price. Review by Bruce, N1RX of Newport NH. This focuser was an upgrade for me. I had built my own 8 inch f/6.3 reflector, and originally chose a low-profile 2-inch helical focuser. This allowed me to keep the diagonal mirror relatively small, compared to a taller unit. After several years of use, I have become more and more tired of the excessive turns required to refocus the old unit when changing eyepieces. I chose this focuser as a replacement. I am very pleased with the result. This unit was about 1/2 inch taller than the original. This required me to move my primary mirror forward the same amount. This was not a problem for me. After installing the new focuser and re-collimating, I am very happy with the result. Motion of the focuser is accurate and smooth. I find the speed of the focus action to be very responsive. The only downside to this unit is the tilting of the drawtube by the locking screw. This has been mentioned by others, but is not a problem for me. With my eyepieces, and for visual use, I have not needed to lock the drawtube. It supports all my eyepieces well, up to and including the 35mm Panoptic. Overall, I am very happy with the purchase, and would recommend it for someone with similar requirements. Review by Paul of Encinitas, CA. 4.0 Fine product... but one caveat. I am very pleased overall with this low-profile 2" focuser. The fit and finish are top-notch, and the action is smooth throughout the full range with both the course and fine focusing. I bought this for my girlfriend's 20" Obsession. On my own 25" I have a FeatherTouch, which costs more than twice as much as this one from Agena. Both of these focusers allow you to loosen the focuser and rotate it on the base, so the knobs can be at an angle, instead of just up-and-down or side-to-side. 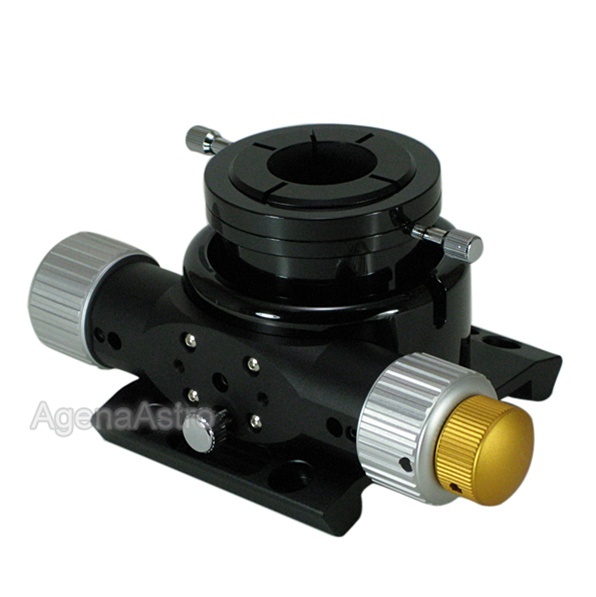 However, this Agena focuser cannot be rotated to any just any angle because the focusing knobs will actually rub against the base at some points. It does work at a 45-degree angle, and that is fine, but other intermediate angles are not possible. If the knobs were just a little smaller in diameter all would be swell, there would be no interference, and I would encourage the manufacturer to make this slight change, which would give them a really first-class product, almost on a par with the FT. 45 degrees works for me, but it may not work for someone else. Review by erikthered76 of New Orleans, LA. Review by Carlos of San Juan, PR. This focuser is a bit on the heavy side... but is very nice. I installed it on to a 8" Orion F/4.9 OTA. Took out the standard crayford and had to drill new holes. The original crayford base was a bit wider so it leaves some holes where light can get in. I just taped those holes and that was it. Mounted it just half an hour. I was able to reach focus with my MPCC and a Canon Rebel XT(350D). The fine focus knob is very nice and it helps a LOT reaching that point of very good focus.